One of our firm’s greatest strengths is the depth and breadth of our Chicago commercial litigation practice. Since our law firm’s founding, litigation has been central to the firm’s operations. Whether in the courtroom, in a deposition or at the negotiation table, our Chicago commercial litigation attorneys are known for their skillful handling of matters. From negotiating or litigating small issues for clients to the coordination of complex litigation of multiple claims in jurisdictions within and outside of Illinois, our lawyers bring thoughtful and practical experience to achieve desired results. We know the fundamental measure of a good client relationship is how little our individual and business clients worry about their commercial litigation cases which allows them to focus on the success of their businesses. From private and closely held companies, to entrepreneurs and start-up businesses, to individual clients, our Chicago attorneys offer personalized legal counsel and work with the client to handle all the day-to-day issues in connection with the business litigation matter. Breach of contract is one of the most common litigation matters. Whether it be a contract dispute between business partners, individuals, companies, or employer – employee contract disputes, our Chicago commercial litigation attorneys are prepared to advise and represent our clients in all such breach of contract and related litigation matters. 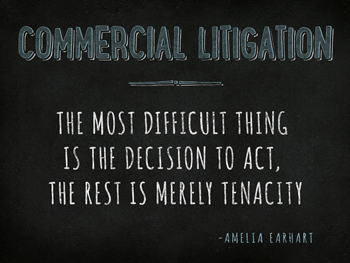 Since our Chicago law firm's founding, commercial litigation has been central to the firm's operations. Whether in the courtroom, in a deposition or at the mediation table, our commercial litigation attorneys are known for their skillful handling of matters. From negotiating or litigating small issues for clients to the coordination of complex litigation of multiple claims in jurisdictions within and outside of Illinois, our Chicago corporate lawyers bring thoughtful and practical experience to achieve desired results. In addition to representing our clients in the courtroom, we also represent clients in alternative dispute resolution process, such as arbitration and mediations. Oftentimes, the parties to a given dispute have already agreed to arbitrate or mediate by contract. Other times, the parties will, by advice of counsel, the court, or otherwise, agree to arbitration or mediation. Arbitration and mediation can be, but is not always, a more cost-efficient way to resolve a business dispute. Our commercial litigation attorneys in Chicago will provide aggressive and careful advice, whether it is in court, through arbitration, or at the mediation table. Our business and commercial litigation practice also prides itself on teamwork. We understand clients’ businesses, and work with them to achieve their goals. Depending on the commercial litigation matter and the complexity of the legal issues litigated, we regularly coordinate with other highly experienced litigation attorneys in to meet clients’ needs effectively and efficiently. We have the ability to handle business litigation across a gamut of industries including, but not limited to, technology, textiles, electronics, transportation, consumer products, manufacturing, health care, banking, insurance, real estate, legal, consulting, restaurant, and agriculture. Further, our business litigation lawyers have resources and experience in many aspects of corporate law, including corporate governance, franchising, finance, mergers and acquisitions, and commercial litigation, and regularly advice business clients on issues related to corporations, limited liability companies, partnerships and professional corporations. 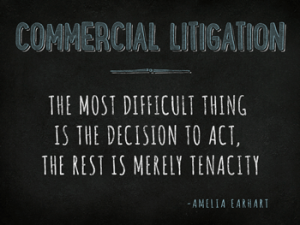 We understand that commercial litigation can often be stressful and costly, both in time and money. We provide reasonable hourly fee arrangements and offer flat-fee, hybrid, and contingent fee litigation services when possible. From straightforward breach of contract disputes to complex multi-party, multi-million dollar commercial litigation and legal malpractice matters, our Chicago commercial litigation attorneys handle cases in state and federal courts throughout Illinois, including Cook, DuPage, Kane and Will Counties. For additional information about our commercial litigation practice or our business attorneys, please contact our law office.